Super Cubes has some extra inventory in this time of container shortages, so we thought we’d share what we’ve got in case you need it! While we can do our best to accommodate all container requests, we are trying to move the following inventory more quickly than usual. These gray containers are in great condition. One-trip/”new” containers are containers that were manufactured in Asia, then shipped to the U.S. where Super Cubes is selling the container to you. In addition to meeting the requirements of used containers, these containers have a fresher, crisper look than used containers. 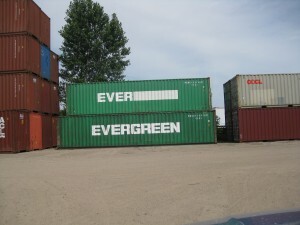 These containers are in Chicago and ready to ship immediately. Please note the picture is of a SAMPLE gray 20' container. It is not one of the ones available, but is similar in quality and color to those available. This cargo-worthy container is great! 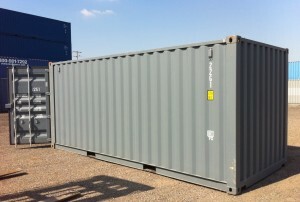 Not only do you get extra length, they are 9’6” AND 8’6” wide – wider than your usual 40’ or 40’ high cube containers. It is in cargo-worthy condition. Cargo-worthy containersmeet the same standards are weather-tight, insect- and rodent proof, have good floors, doors, seals on the doors AND have the structural integrity to be used in shipping overseas. Please note that the containers in this picture are all a part of the same set of 48' containers. The 1 available is similar to these particular containers. 48' container. Containers available are from this set of containers, but not necessarily the same container as in the picture. If you mention this blog post, we would be happy to give $75 off of our regular price on these containers! Sale limited to the containers listed above. Once the containers are sold, this deal is no longer valid.